Every since we moved in to our ‘new’ quarters, I have been stressing about the kitchen. We spend a lot of time there. I truly believe it is the heart of a house. When we look for a house that is the first thing I look at. This time it was a little different. There were other details about this house that outweighed the kitchen issue. As with all things decorating, I do a lot of thinking, planning, and looking before I just go and ‘do something’. 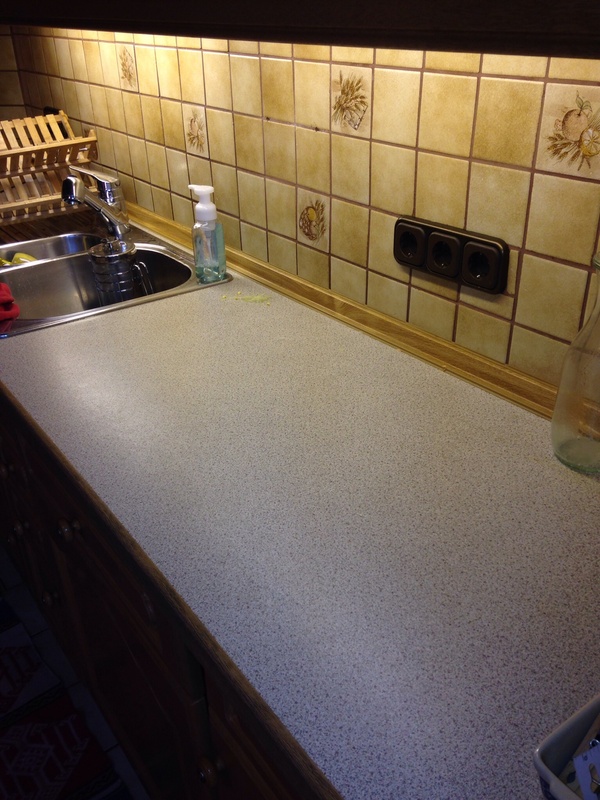 The main problem with the kitchen is the lack of counter space… prep space. This is it. I did develop a system of cooking in segments. Constantly rotating tasks through this space. I knew what I wanted was an island or a possible island. I also needed some storage space. I currently have all food downstairs in a room turned into a pantry. It is the ultimate walk in pantry! All the cabinets are filled with dishes. Yep, a lot of dishes! This is not my house. Everything I buy I have to think ahead to what Hubby and I call our forever home. The one that we will purchase when we move back to the states. 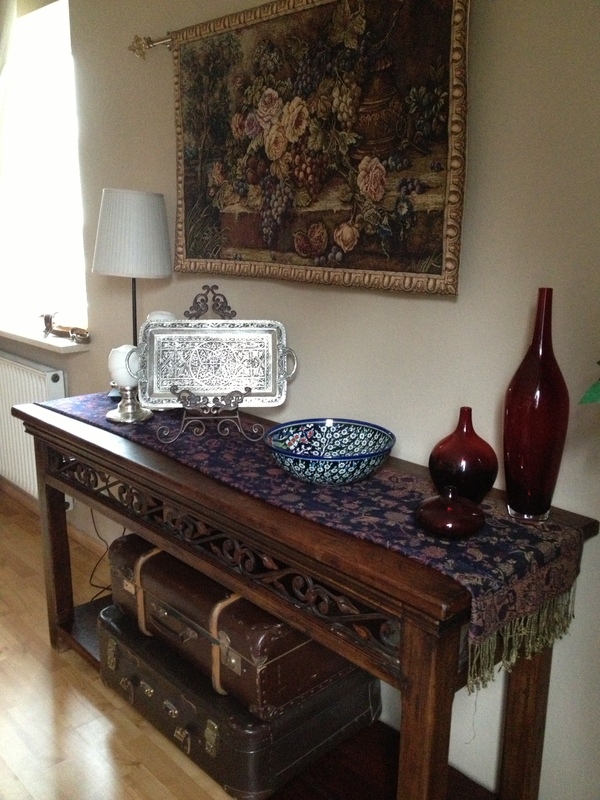 This a Buffet table that we have had for a number of years. I loved the bottom shelf for open storage. This what I wanted. I have been looking for months. We have found possibilities, but there was always something I did not like. A couple of weekends ago, we went to an antique fair. Hubby just goes because he knows I like to look. However this time it was a little different. Hubby walked in and looked around and started walking to a beautiful piece. I followed because Hubby does not usually do that. I wanted to see what he found. What he found was the solution to our kitchen problem! He found an absolutely amazing 19th century English sideboard. He said in his casual way…what do you think. I agreed with him it was amazing but it was to big for the kitchen. (Picture a lightbulb going off here!). I then started thinking… We have or I have been looking at this all wrong! I was looking for a perfect piece that I already had to solve my problem. 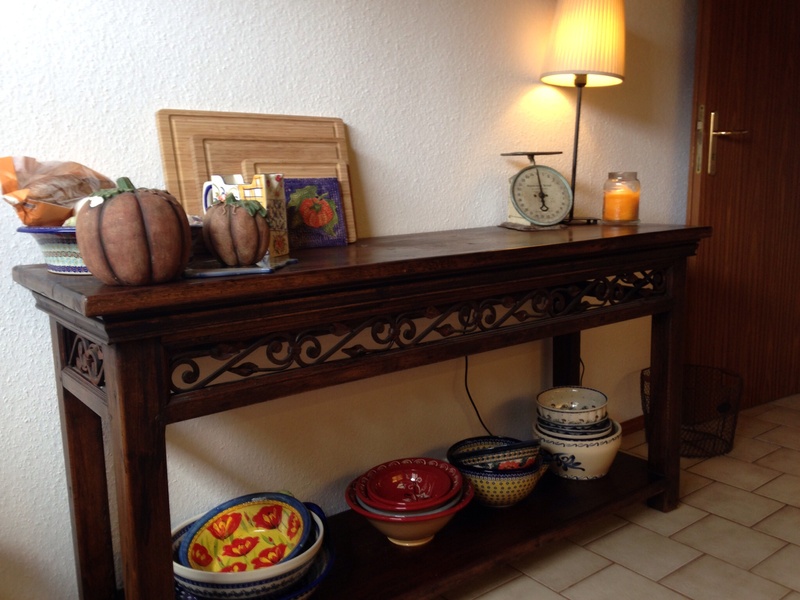 We decided that we would trade the buffet table for the sideboard. Bingo, problem solved. Easy. We went and purchased the sideboard! More on that tomorrow! This weekend our sideboard was delivered and we moved things around! Perfection! I have storage for my bowls. I moved them out of the cabinet and move food in. What a thought, food in a kitchen! Of course, I had to add things to the top! I now have my cutting boards easily accessible. I also have a bowl of onions, garlic, and peppers out and ready to be used. 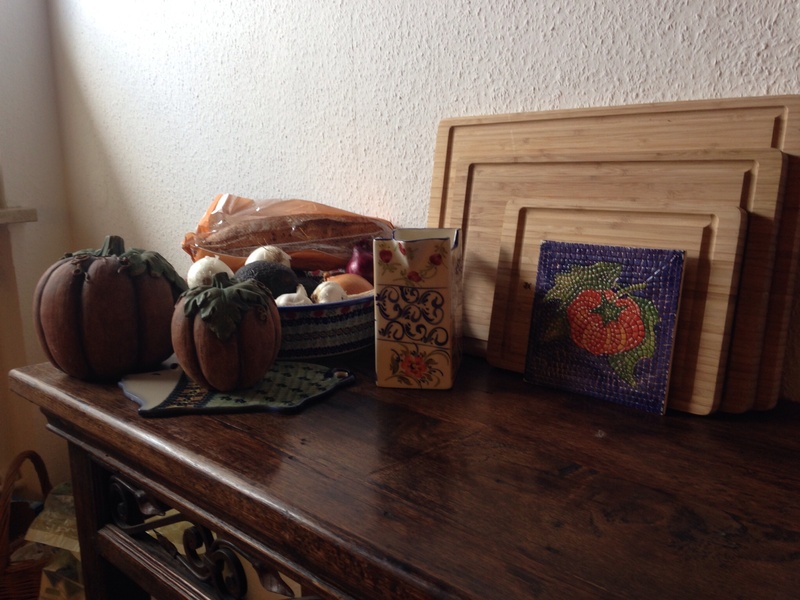 Yes, I had to add some Fall touches with the pumpkin tile and wood pumpkins! I do still have space to prep for meals. I am so happy with the results. Now Hubby and I can cook in the same space without getting in each other’s way. Stay tuned tomorrow to see our new sideboard. It is a beauty! We are not TV people. Reality tv is something we do not watch. In fact the only way we watch tv is through DVDs and now iTunes. Yes, we still have a DVD player. The other day I was looking at kitchen designs and I saw a couple of pictures of this simply amazing kitchen. I clicked and saw the kitchen was from the tv show Brothers and Sisters. I find it interesting when events kind of flow together. 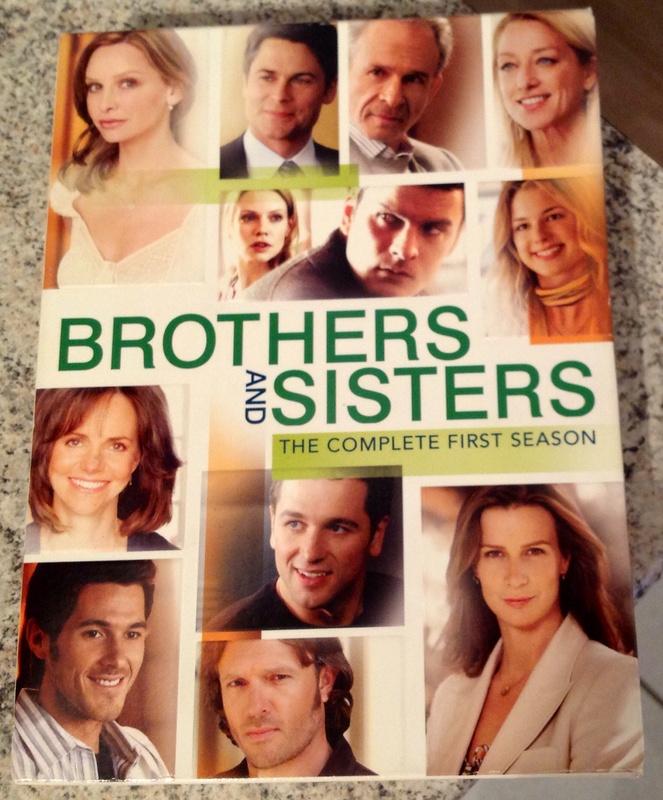 Hubby had just brought home season one of this show from the library. He said we might like it. He told me that Ally McBeal was in it. Oh, how I loved that show! The dancing baby. That was one show I never missed. Oh, how I digress. We started watching the show this week. First off, what a family. I think I understand why they drink so much wine. But the kitchen… Everytime they have a scene in the kitchen, I press pause. I just take it in. Hubby said if I do not stop doing that, we will never get through the season. I promise it will try! Rob Lowe has just entered the show. Maybe I will press pause on him instead. Probably not since I cannot stop drooling over the kitchen and the pantry. Give it to an old tv show to getting me excited about kitchens. I am not sure this was the purpose of the show! Years ago when Amazing Daughter was young and I was trying to get her to see that juice and water should be the beverage of choice, I worked every angle to accomplish this task. Enter the common pitcher. That did not work for her. Plain. Then I went kid fancy. That did not work either. Finally I went just pretty. This kind of worked. (Actually, when Amazing Daughter was put in charge of making the juice, that was the winner!) So began my collection of pitchers. Proudly on display in the kitchen, a small (yes I have more….) part of the collection adds beauty, color, and easy access to a daily essential! If you have not figured it yet, blue is my color. Always has been, always will be. I always look for colors that compliment my chosen color. It is like a beauty pageant! “Now on stage representing the beautiful country of Poland wearing a hand painted bouquet of flowers….” I could do the whole post like that. I will spare you. I was never a big fan of yellow but for some reason I just love this one. This was a gift from a student. The French do blues and yellows well. This two are Italian. I just love the rooster!! It was Amazing Daughter’s favorite orange juice ‘container’. Found this one at a flea market. It is for tea. Imagine how happy I was! The last two are also Italian. I am always on the look out for unique pitchers. Now aren’t you glad that I did not use this post to display my commentator skills?